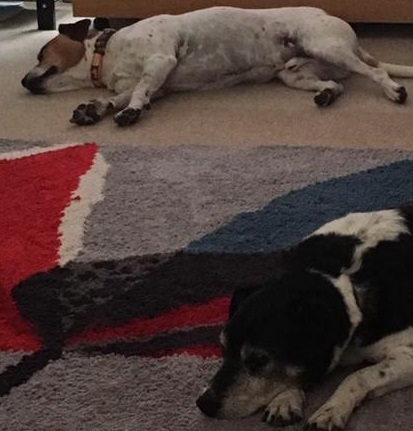 29/8/18 – Thanks to his appearance on the Oldies Club website, Alfie now has lots of home offers to choose from and Goodward Dog Rescue aren’t able to take any more applications for him. Well done Alfie! 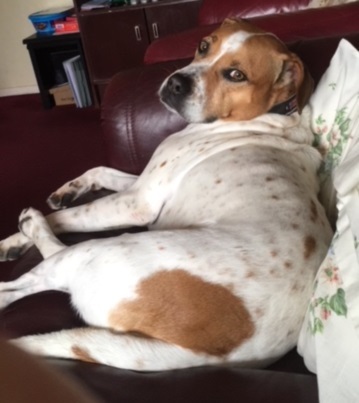 Alfie is 8 years old and he is a gorgeous Pointer/Hound cross Staffy. He’s a very handsome and unusual mixture with a loyal, kind and friendly nature. Although his owner loves Alfie very much, sadly the landlord has a no-pets policy and Alfie needs to find a new home. Alfie is still with his owner, in Rustington, West Sussex while he is rehomed by Goodward Dog Rescue. Alfie is a true gentleman and he gets on well with people, especially women, and he loves being gently petted. He is fine with men too, though rough play is not his style – he’s far too refined for such things! He is a tolerant boy who is good with dogs and will happily share his home, and even his food bowl, with compatible dogs. Out and about he can be wary of some larger dogs and might bark at them. 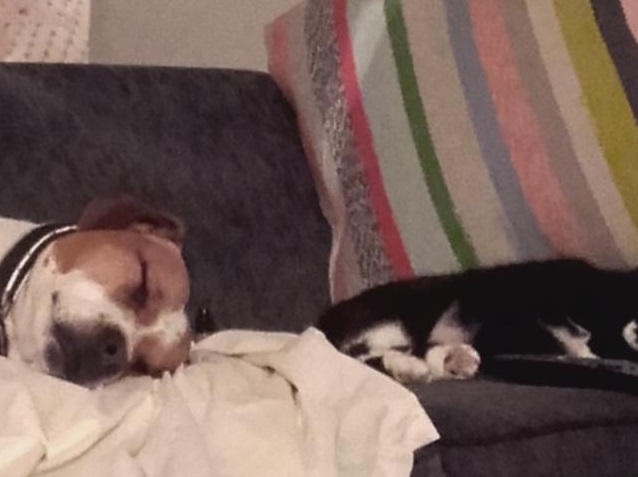 He’s very good with cats and will be happy to share his new home with them. Alfie is calm indoors and can be left for several hours with no problems. He would prefer a quiet home as he finds noise quite upsetting, but a home with visiting children aged 8+ who are kind and considerate would be fine. Alfie struggles with thunderstorms, fireworks and loud bangs, but wearing a storm vest helps to calm him. He enjoys playing with you with his toys, and he also likes to relax on the sofa or lie in the garden. 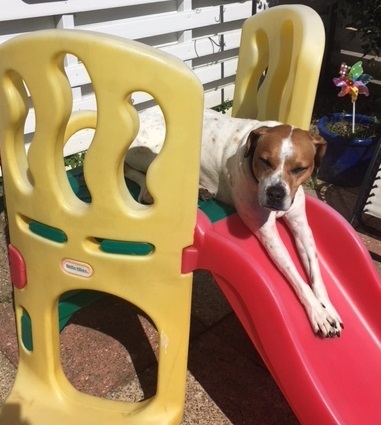 He is very happy to settle down on the slide, sunlounger or whatever reclining furniture he thinks you have put out especially for him! He enjoys country walks and is good on the lead and his recall is generally good. He likes to swim in the sea, and then he sits in the shower of his own accord, waiting to be washed down after his swim! 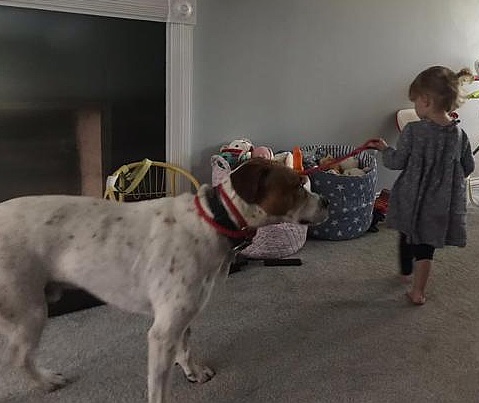 At times he can get anxious on walks and will suddenly sit and not want to move, but this is happening less and less often now as he feels more at ease and confident. Alfie is a really fabulous dog. He has no known health problems, is neutered, vaccinated and microchipped and Goodward Dog Rescue provides lifelong back up and support. A homecheck and donation apply. Could you offer Alfie a new home? Please mention that you saw Alfie on the Oldies Club website.